Perennial of the Year 2009! Looking like a golden-green waterfall in the slightest breeze, 'Aureola' makes an excellent container plant or as edging to light a pathway. It is best in shade with dappled sunlight. 'Aureola' is a golden-striped woodland grass that is native to the mountainous areas in Japan including areas around Mt. Hakone. This grass is considered a deciduous perennial that typically grows in dense spreading clumps and features gracefully arching green leaves variegated with gold striping. Yellow-green flowers appear in mid-summer. 'Aureola' is best grown in moist, humusy, well-drained soils in partial shade. Be sure to provide the plants with consistent moisture as leaves may scorch in hot summers, particularly when consistent moisture is not maintained. 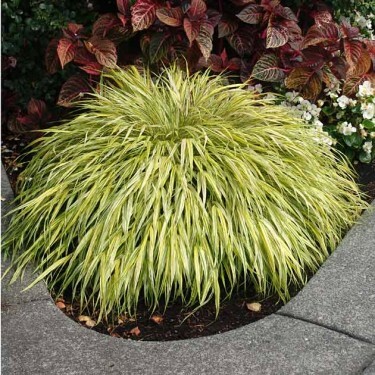 Plants will also grow well in deeper shade but the gold variegation changes to lime green. 'Aureola' spread by rhizomes, but are not considered to be invasive. It's foliage should be trimmed to the ground in late winter to early spring before the new shoots emerge. Mulch in winter.